Divya is a student at a nearby public school; classes there consist of about fifty students so she comes to the Hope school in Tigri for extra study. Although she loves her public school, she says she really enjoys the smaller classes at the Hope school and the help of her teachers as it not only expands her studies but she has also made lots of friends here. 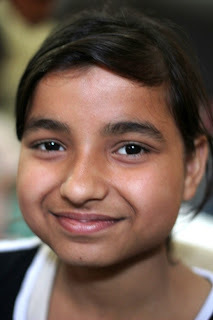 Divya’s father is a salesman and her mother is a housewife, helped by her daughters when they’re not at school .Divya enjoys cooking with her mother and she sits with her to do her math homework. She is the youngest of three daughters (all of whom share a single bedroom) and like her eighteen –year-old sister she would like to become a teacher at a public school. She hopes to do this as well as being a mother. In the running of a primary school there are always many needs and we wish to thank all our existing donors for their support and prayers. We request that you kindly partner with us in meeting the needs of the kids. Ideally, we ask that you consider sending us regular donations. Our contact details are provided below.